Blessed Newman to be canonized. On Wed. Feb. 12, Pope Francis authorized the Congregation for the Causes of the saints to publish a decree about the second miracle attributed to Cardinal Newman’s intercession. A pregnant woman in Chicago presented serious bleeding during her pregnancy and prayed to God for healing through Newman’s intercession. The bleeding stopped and her child was born normally. Pope John Paul spoke of the need for new heralds of the Gospel. These are the saints. And God continues to bless the Church with these men and women. One of them is Cardinal John Henry Newman (1801-1890), a teacher at Oxford, a convert from Anglicanism, founder of the Catholic University of Ireland, and of the Oratory of St. Philip in England. His canonization will interest more people in reading about his life example and his works. His homilies and his short meditations, in particular will help readers to grow in interior life and practice of the Faith. There are many good biographies by authors such as Ian Ker, Louis Bouyer and Meriol Trevor. I have written a short biography titled Passion for Truth, the Life of John Henry Newman published by TAN/St. Benedict. The saints love for God is very real, simple, and palpable. Newman teaches us to adore God in the H. Eucharist, to marvel in his mysteries, and to obey Him. He inspires to love God and our neighbor. God raises new saints who emphasize different truths. One of important teachings highlighted by Bl. 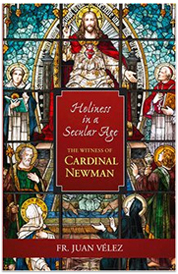 Newman is the doctrinal principle – God has revealed some definite truths to man, first though natural law and then by means of divine revelation. We can know these truths in an objective manner in the Scriptures and the teaching of the Church. We should not pick and choose what truths to believe. Nor can any priest or bishop teach truths that contradict the teaching of the Scriptures and Tradition. There has to be a real continuity with the teaching of Christ and the Apostles. Some theologians try to adopt Newman to endorse a view of development of Christian doctrine that is contrary to what he taught about a doctrinal principle in religion, and criteria of continuity. English theologian Aidan Nichols has presented well Newman’s teaching on the subject in a book on the development of Christian doctrine. Newman contribution on this subject alone would be sufficient cause for him to be held up as a teacher of the Faith. His teaching will be of great benefit to the Church, particularly in this time of confusion regarding teaching on marriage and human sexuality. Let us give thanks to God for the upcoming canonization of Bl. John Henry Newman, and ask this new saint to intercede for us and for the Church.